The Medicare Modernization Act (MMA) established Health Savings Accounts (HSAs), which are tax- advantaged savings vehicles that can be used to pay for medical expenses incurred by individuals and their dependents. The purpose of this project was to examine the potential impact of HSAs on insurance coverage. 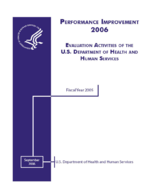 This examination included: (1) Developing baseline estimates of the numbers of individuals that will be covered by HSAs; (2) Developing estimates on the number of additional low-income individuals that would obtain insurance coverage, if HSAs were offered in combination with either tax credits or vouchers; (3) Developing estimates of the costs to the government associated with tax credits or vouchers. Using a combination of public and private data sources to examine the impact of consumer directed health plans generally and HSAs more specifically, the analysis found that the national adoption of these plans might be significant. The baseline (unsubsidized) simulation indicates that there could be approximately 3.2 million HSA-covered members of the U.S. population between the ages of 19 and 64 who are not students and not enrolled in public health insurance programs. Depending upon the generosity of the assumed subsidy, additional simulations found that upwards of 12.8 million previously uninsured individuals could enroll in an HSA plan.